Zambia : Why is the Zambian government selling our country to China? Home Headlines Why is the Zambian government selling our country to China? We, the undersigned civil society organisations have noted the defence of Zambia’s debt to China made by the Patriotic Front Media Director in a response to concerns raised by ACA Director, Laura Miti at the levels of that indebtedness. In responding to Mr Chanda’s sentiments, civil society would like to begin by welcoming his decision to engage us on the critical matter of debt. We welcome the PF Director’s statement because it is civil society’s considered view that Zambia’s overall indebtedness, but especially its indebtedness to China, is a national crisis that requires government to engage citizens openly and in depth. For that reason, we do wish Mr Chanda’s statement had answered the critical questions that are repeatedly being asked by citizens about Zambia’s debt level and strategy. However even his rather personal response provides us with an opportunity to engage. In a paper produced for the Centre for Trade Policy and Development in May 2018, Trevor Simumba highlights the fact that Minister of Finance, Ms Margaret Mwanakatwe, stated on 21st February 2018 that China is a natural first creditor and that 28% of Zambia’s debt is owed to China. Why is this a problem? According to Mr. Simumba, “there is a severe lack of transparency over many key questions, including repayment, contracting obligations, project feasibility, value for money and loan security. This lack of transparency makes it impossible to have a clear account of the implications of this borrowing for the public finances”. In other words, it is not clear what the impact of the debt burden will be in the short and long term. It is not even clear exactly how much Zambia owes to China and therefore what the country’s overall debt burden is. Zambia is a participant in the Chinese “Belt and Road” initiative. This initiative aims at increasing trade with developing countries all around the world through infrastructure development. With commentators across the continent and the world raising red flags about China’s damaging lending strategy, a Centre for Trade Policy and Development report estimates that 95% of all of Zambia’s external debt for export and supplier’s credit comes from China. Why should this concern Zambian citizens? In an article dated 3rd September, Quartz reported that, “John Hopkins University’s China-Africa Research Initiative found Chinese loans to be a significant contributor to debt distress in three countries: The Republic of Congo, Zambia, and Djibouti”. While Mr Chanda suggests in his statement that Zambia is in complete control of its debt with China and tries to allay fears that critical Zambian assets such as ZNBC and ZESCO are in danger of takeover by China if the country defaults on debt, the truth is much grimmer. One only has to look at the impact of the Chinese debt burden in Sri Lanka to see its potentially chilling effects. The New York Times reports that Sri Lanka owes more than US$8 billion to China. Due to their failure to pay their debt, Sri Lanka gave away a 70% share of the strategic Hambantota port to Chinese state-controlled entities and gave China a 99-year lease on the port. In other words, Sri Lanka lost a critical port to China because it defaulted on its debt. Given the lack of transparency by the Zambian government on its borrowing, there is a real danger that Zambia too might fall into the Chinese debt trap. This is troubling as key, strategic national institutions such as Zambia National Broadcasting Corporation are now controlled by a Chinese state-controlled entity. The new national airport is also being constructed with Chinese funding. Zambia has just contracted loans of US$ 30 million for the modernisation of Mulungushi International Conference Centre and another US$ 30 million for the expansion of the electricity supply for the Lusaka East Multi-Facility Economic Zone. Civil society and indeed the Zambian people are not against China or the Chinese investment or aid but there is a real concern that is growing to anxiety at the unaccountable, very opaque and seemingly non-strategic manner in which the Zambian government contracts and manages debt. Zambian citizens cannot but notice the punishing levels of tax that the government is imposing on an already overtaxed population. Zambian citizens cannot but notice the punishing levels of tax that the government is imposing on an already overtaxed population. Civil society is convinced that a government that has over-borrowed is now bleeding citizens in an attempt to fill the gap in the fiscus that is left by huge debt repayments. Unfortunately, even as budget is clearly in a major deficit, government refuses to have an honest conversation with citizens both on the extent of our debt and it plans for repayments. It also continues to be very non-transparent about how debt money is spent. It is that full disclosure CSOs ask government and ruling party representatives like Mr Chanda to engage implement. The Zambian debt is like a cancer. Unfortunately, the heaviest burden of debt is placed on women and children. It cannot be denied and denying it only makes its long-term consequences calamitous. Zambians deserve to know the truth about the nation’s debt. We therefore urge the government to stop and think of the potential consequences of continued reckless borrowing if not out of a sense of patriotism then out of a realisation that it could cost them where it hurts – at the ballot box. Why is the Zambian government selling our country to China? Because the checks and balances mechanisms in the country are dead. Because the PF keeps winning genuinely poll after poll. Because the civil liberties of yesterday and that of today are completely different. Because double h sold the mines. Because the nation had unprecedented number of general elections with a time where you would normally have 2. Because government has failed to diversify. Because your bye elections are a waste of national resource. Because your constitution is faulty and you spend resources tryna fix it. That is why. And many more. Well because I can’t trust UPNDEADS and I will keep voting for PF, not that they are the best, but because I don’t have a choice. Why because double h sold our assets. Because our economists are in deep sleep. Because ECL removed Mutati as finance minister. Since the whites swindled you out’a your national assets, you’re gonna dance to their tune. Without assets and a sound economic diversification policy, sound checks and balancing tool and a real nation audit mechanism, it’s advantage China and ever indebted Zambia. Man, I feel like relocating to China. First LPM squeezed our waists through a punitive tighten your belts HIPC policy but our situation got even fishy afterwards. Really laughable…US$ 30 million for the modernisation of Mulungushi International Conference Centre, you can build a new one with such figures…I bet you they will use the same outdated designs as KKIA…Chinese glass and tiles it no wonder Chinks are setting up factory in Lusaka East Multi-Facility Economic Zone but our leaders are too dull and shortsighted. If you are child fit to be my baby, then you were born yesterday and you would think Zambia is being sold to China. If you were born in Northern Rhodesia you will know that a major project that was done for Zambia was the Kariba Dam ONLY at one time. The rest that was done was ‘accessory to murder,’ i.e., the rail line, etc, all where for transporting stuff out with minimum development to Zambia. The Southern Rhodesians, themselves, did not hide the truth, “Northern Rhodesia was there to be exploited only. It was just a source of wealth. Nothing more.” This was one of the reasons KK and others fought for independence. Animo Farm you think China is just exploiting Zambia? Zambians should be thankful for infrastructure development that is happening. We were behind many countries such as Ivory Coast, South Africa and Zimbabwe because we were just being milked the same way HH was milking the cow of privatization. What China is doing is a blessing to Zambia. We are learning and we will be a different country altogether. Remember, those who colonised you as much as they did a good job, they never wanted your country to develop – FOR A REASON! Soon, we too will be at a level where we can develop like all other developed nations. If we do not do this we still lag behind. HH and his TRIBAL GROUP MUST NEVER be allowed in power. They are retrogressive. Animo Farm with LAUGHTER DISEASE. You are pathetic. China is great! It is give and take. HATRIBES Ha Jealousy Hagain! We are developing this thing and it is jealousy! Hagain! I mean the COALITION OF THE WICKED. What is selling? Who is the buyer and who is the seller? You criticize everyone but content misses from what you say. When government calls for contributions, indaba, or any form of discussion or contributions, you are mute yet speak when not called in the name of advocacy. You are are disappointment. (Continued)… they can be forced to tell the truth. She from Malawi. Her father used to be manager at Mwaiseni Stores in Chingola. But that’s not important. What’s important is is she making sense or making noise. You wanted her to be Chinese? This is the generation that we lead this nation and the generation the current leaders are nurturing …they will look at your surname before they hear what you have to say..
ECL doesn’t make laws. Your MPs do. Various institutions enforce them. Yes, Zambia belongs to Zambians. This cuts across political divide. The biggest opposition party in the land is the biggest let down Zambia has ever witnessed. Guess what? It is headed by the biggest sell out. Don’t ever delink the articles headline to Zambian assets today and yesteryears. Your assets put money in your national coffer. The national human liabilities double h and FTJ decided to sell your mines. Can Saud Arabia or Iran sell their oil fields and be considered normal? Yes, stop ECL from further selling Zambian assets if you feel he is. This feels like Esau selling his birthright for a bow of soup. Being poor is a curse. Don’t let them sell your assets again, else you’re dead. Was HH incharge of selling the assets or was he the main decision maker ? He wants to leader of this great nation. Did he stop crooked FTJ, no. Chap supported and was part of the rot. Was he in GRZ ? The rot was done by crooked HH. He was a rot. AN inside trader. There should be national documents that prohibit the president or anyone for selling ownership of national assets no matter the economic situation. Violation of this law is automatic impeachment or dismissal. Lets always remember Lungu works for Zambians and is not Zambia’s boss so his decisions must be in the interest of Zambians only all the time. The so called development is money from taxes that Zambians contribute and not his personal money. His job is to make proper decisions. How are national debts contracted? Is it out of the domain of parliament knowledge? Honestly shouldn’t a member of parliament let alone a Zambia citizen be aware of the debt the country has contracted or about to contract? National debt should be a public spectacle. Insinuation and conflicting stories about national debt standing should be put to bed rest people with ulterior motive and misguiding information take to the street or different podia yapping and yapping. The conversation about national debt should always be in the public domain. If there are monthly or quarterly publication on debt let the MIBS siliya avail this info always. It’s like hubby or wife who tries to secretly contracts debt in a marriage setup. How can national debt be public when we lungu signing for debts in corners alone like the ZESCO debt ? Then stop yapping. How can the handling of a sensitive subject like borrowing be vested in one fellow called the President and his subjects. Are you nuts? Is that normal? Look who is talking and what he is talking about. How is what you are insinuating even be possible as if Zambia is his plot? Seal the loopholes if that shouldn’t be the case.Yap yap! Then tell us how lungu managed to sign a now aborted refinancing package of $500 million for zesco without parliament ? THORN IN THE FLESH —– IT IS AMAZING HOW YOU HAVE BEEN CAPTURED BY THE PF LIES. HOW CAN AN ACCOUNTANT SELL A MINE ???? HAVE YOU NO BRAINS AT ALL – THIS LIE WAS PERPETRATED BY THE PF SO THAT THE NATION CAN STOP BELIEVING THAT HH IS OUR ONLY WAY TO A BETTER ZAMBIA. THE MINES, WHEN ZAMBIA BECAME A DEMOCRACY, WE DISFUNTANAL THAT IS WHY INVESTORS WERE CALLED IN TO START MAKING THEM PROFITABLE AGAIN. YOU ARE SO FILLED WITH HATRED THAT YOU WOULD RATHER LET THE PF SELL OUR COUNTRY TO THE CHINESE THAN HAVE UPND LEAD IT INTO PROSPERITY. SHAME ON YOU. I HOPE YOUR CHILDREN WILL HOLD YOU ACCOUNTABLE FOR THIS ! Tell me that Chile sold their copper mines too. Tell me that South Africa sold their platinum and gold mines too. Maybe you were too young to understand. Ask double h son of your soil if he wasn’t part of the crooked gangs at the center of looted proceeds from the sale of ZCCM. See, a thief is a thief whether you deny it or not. All our mines were sold in broad day light my kids and double h was deep inside of it. @ spaka, you lie with a hot tongue. So devilishly out’a credible reality. Donald Chipenzi, Laura Miti and others are cadets for the Unpatriotic Party for National Downfall. Such negativity will kill you. Fact is that Zambia is many years back with it’s developmental projects. Look at most of the Infrastructure such the road network, health and learning Institutions. How else do you think we can get there when Donald Trump and others are not willing to assist us. Common, even to build toilets you need Chinese ? What do you understand by the word “Patriotic”…you have GRZ contracts being handed to foreign companies ..do you call that patriotic? Even mighty South Africa is being sold to China. I wonder why our favorite USA isn’t buying us. World Trade is cyclical. The US is world’s biggest economy. Euroland is a major trading partner of US. Then China is leading trading partner of US and Euroland combined. Where is the problem? Trading with China is equivalent to trading with US and Euroland. Please take time to attack China. China is trade partner. The hypothesis of selling certain countries to China does not make sense. If loan repayment failure was founded on sound economic fundamentals, then loans could be rescheduled. Stop scaring potential investors. True, there are a lot of speculations called ‘facts’. Please provide examples where China has grabbed national assets. Debt is bad whether from China or America. It is okay to speculate but the Civil Society should do more – research and do not depend on newspaper articles and opinions not just fight the China – Europe versus America trade wars. In 1995, the European Union tried to fight China in what was then called the Bra War, when the union tried to stop finished garments from China to enter the European market just before Chrismas. This failed because “Made in China” rules the world today! The article has been dilute by 2 upendi cadres. You can’t have only all theives giving us artcles now can you ? We know their agenda, to steal and loot only…. What is the population of Zambia 17 million, 18 million ? 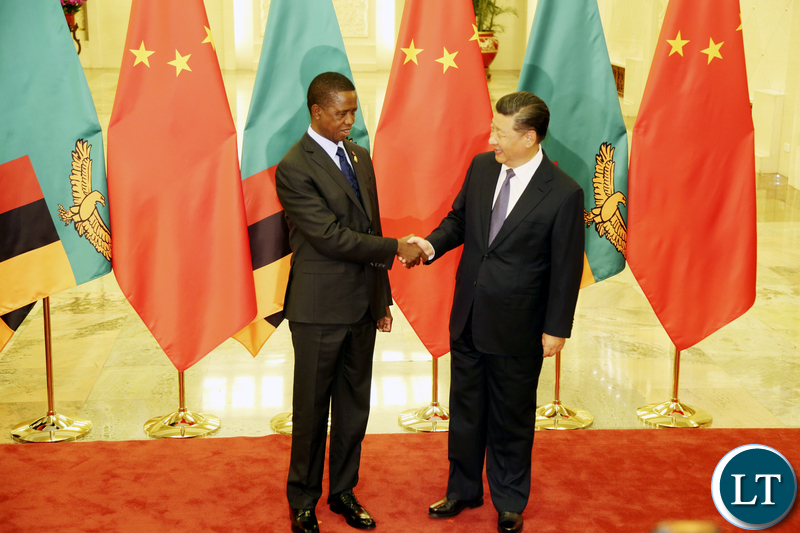 China should just give every Zambia in $1 million and have the country…..they can afford that…..
Unrepentant liar. You are such a low key cheat. Chicken Little. The Chinese economy is only worth $19 Trillion and paying 18 million Zambian $1Million apiece would cost China a whopping $18Trillions $$$ and render them bankrupt. Not even the wasting copper that lies underneath our country is worth half of that! Zambia was once a reach country before the copper was wasted away with that gain but so much pain for the natural owners of soil. The Chinese economy is only worth $19 Trillion and paying 18 million Zambians $1Million apiece would cost China a whopping $18Trillions $$$ and render them bankrupt. Not even the wasting copper that lies underneath our country is worth half of that! Zambia was once a rich country before the copper was fleeced and wasted away without any gain for her people but leaving so much pain and anguish for the citizens. Upendi cardres must stick to upendi. And not infiltrate credidle non partisan ngos. And your Endemically Corrupt Leader did loose his licence because of criminal acts. HH did not sell any companies, it is CORRUPT vise, visionary and anointed convicted embezler you voted for that is selling the Country, lock, stock and barrel!!! UPND is a tribal H-organisation for TTONGAS and a few other people who support tribalism. They have no interests of Zambia – the whole Zambia at heart. HH will never be a president. He is Under Five, Childish and NOT presidential material. He is a THIEF too. He is also UNLIKABLE & UNELECTABLE. #1 Dont care, if it’s from Laura Miti and Sarah Longwe, I will fall asleep. According to a news report earlier this week, CSOs (NGOs) have received a grant of some K45million for civic activities. As they replace their ageing personal to holder vehicles with brand new ones, you can expect this level of noise and more in the coming year to hoodwink their donors that they are working. Not a few international flights to attend conferences and seminars will also be recorded. By the way Mr Sarah Longwe, where is the contract of sale? Please share with us. The question is whether China is even interested in buying Zambia at all? I personally don’t think so. China has more important goals on it’s agenda – it’s own economic growth foremost. They need our resources to maintain their economic strength and so as long as the copper is flowing and they can maintain their position as a major supplier of manufactured consumer goods in Africa, all is fine, but I don’t think they bother much about recovery of their national debt. A sober fact is that Zambia is not under a threat to deal with China, plus it is not the only country in this situation. Most African countries and a number of developed countries are in a similar position. Most of them are harnessing the experience and creating opportunities for themselves. You are too gullible and docile to understand Chinese long-term strategy…even principles such a Sun Tzu’s Art Of War would fall on deaf ears to you. @14, You are wiser than Hallucinogens. Because 14.1 is HALLUCINATING. He is hallucinating in his mother tongue. That is why he is projecting his on you! Buying and collecting collateral are two different things. Do you think they want to lose completely? Creditor does not want to buy your thing or your land, but they have to find something of value to capture some of their loss. ZESCO is a good capture. They will get even Kariba power station. I think it’s good deal for them. We must indict Lungu at all cost. Hope it’s not true. We have a choice to refuse relations with China and deal with other countries, so let us stop crying and blaming each other endlessly while China’s economy keeps growing and getting stronger with our resources. Like I said you don’t understand and are a forgetful woman…you borrowed for consumption when we told you right here you yourself called us bitter …I can bring archive posts where you posted in support of borrowing!! Jay J, your personal attacks are uncalled for. Just stick to the topic and show me how I’m wrong. I’m not forgetful and yes, I have supported borrowing but only for infrastructure and other economic projects. I however, do take issue with any notion that someone is trying to sell our country or that there is an intention on China’s side to purchase Zambia on the long term. Long term economic relations between Zambia and China will be mutually benefitial to both countries since both will no longer be dependant on America and the EU who have always tried to use their economic strength to politically and socially influence our countries. So you think China is helping you because they like you..giving you loans (without conditions) for overpriced substandard infrastructure built by their own companies and materials with zero value addition to the economy …you can not see beyond your noses. Do you want me to draw you a picture? Simply look at the type of factories the Chinese State Companies are setting up….add one and one together. Anything from Laura Miti,M.Chipenzi(a tonga) is useless as these are known UPND cadres! !They cannot say anything objective! !I CANT EVEN READ THE NONSENSE ABOVE!!! surely,who is selling Zambia to China?UPND and tribal followers must be real! !Thats why they lose elections.China is a second biggest economy in the World.all african presidents were recently in China to attract investment into their countries.South African president even told off all those who are saying China is buying out African states!!!! CHIPENZI AND LAURA MITI SHOULD ACCEPT THE FACT THAT NO COUNTRY TODAY IN THE WORLD CAN DO MINUS MONEY FROM CHINA!! !EVEN AMERICA SEEKS HELP FROM CHINA!! !Hence let these UPND cadres hiding in fake NGOs go to hell! !CHINA IS HERE TO STAY IN ZAMBIA!!! America is financed by Japan. Useless bunch of losers called civil society. Civil society my foot!!!!!!!! Grow up and get a life, you are busy enjoying driving along ring roads made from the same loans you are crying about. Why cry about China that is uplifting the standards for the country. Late Michael Sata MHSRIP, used to say Zambians have potholes in their heads and this is true for these CS chaps. Immigration is the hot issue in the West during campaigns. I encourage opposition in Zambia to campaign on the anti-China platform. This will win you more votes than you have ever gotten. We are dealing with politicized NGO’s, the people who signed the document are, if not all, opposition party supporters. The world’s richest nation, the United States of America, owes China more money than what the whole of Africa owes China. Are you telling me that the USA has been sold to China? Those who have eyes to see can tell you that Zambia is changing for the better, only Haluza Hagain and his NGO’s have decided to close their eyes. Thank you, China for what you are doing to our country and we ask you to continue. For the NGO’s, tell your funders to increase funding to you, now that you have made your comments. Owing money is not the same as owing money and controlling strategic asserts and owning most of the prime land…..as a matter of interest name one American strategic industry bought and owned by China ? If your way of government is so as to allow one fellow called the President and his subjects to contract loans by a stroke of a pen then you are damn as a country. But like I said, with a dead opposition party and so sick civil liberty organisations, it’s advantage China and so dead Zambia. Good luck! What is this nonsense you are posting…is it sarcasm!! Good afternoon madam Pamela iam completely lost how do we waste our time responding to Sunday Chanda’s article. This chap is not in government and is not government spokesman. I bet u wen time comes for the chief government spokesman to respond, it will be a total different story and answer. Very Interesting article written by an Indian Economist about world economy. Amazing logic indeed. This is a crazy world! How valid is it? I leave it to you! The Japanese save a lot. They do not spend much. Also, Japan exports far more than it imports. Has an annual trade surplus of over US$100 billion. Yet the Japanese economy is considered weak, even collapsing. Has an annual trade deficit of over $400 billion. Yet, the American economy is considered strong and expected to get stronger. India itself keeps its foreign currency assets of over $50 billion in US securities. China has sunk over $1.1 trillion in US securities. billion a day, to the US! A Chinese economist asked a neat question. Who has invested more, US in China, or China in US? The US has invested in China less than half of what China has invested in the US. But the US has invested less than $20 billion in India. Why is the world after US? The secret lies in American spending, that they hardly save. In fact they use their credit cards to spend their future income. That the US spends is what makes it attractive to export to the US. So US imports more than what it exports year after year. China is good not only to zambia but to africa and the whole world try to look at china at wider perceptive than from the zambian view , china supplies almost everything the world needs to all countries in world chinese goods flood all homes in every country are from china, china is linking Europe to china by road network . The reason why america is so mad at china, you can isolate yourself from china and remain behind , china is a better invester than all those colonisers who took everthing from africa and left africa perpetual begger to the western countries , they skilfully devised ways of milking africa of its resources , yet maintened africa poor and looking to them for the enslaving loans that do not finish with strings that control africa in every area of life . If the customer will not buy, the shop won’t have business, unless the shopkeeper funds him. The US is like the lucky customer. And the world is like the helpless shopkeeper financier. Who is America’s biggest shopkeeper financier? Japan and China of course. Yet Japan is regarded as weak economically. Modern economists complain that Japanese do not spend, so they do not grow. To force the Japanese to spend, the Japanese government exerted itself, reduced the savings interest rates to almost zero, even charged savers for keeping their money in the bank. Still the Japanese did not spend (habits don’t change, even with taxes, do they?). Their traditional postal savings alone has over $1.2 trillion. Thus, savings, far from being the strength of Japan, has become its pain. Lukanga Kafusha Justice even from your photo one can tell you are not the sharpest tool in the kitchen drawer…a so a lender is telling you that he can not lend you money because you are unable to payback as you have too much debt and you call him a big thief…if he was a thief he would lend instead of telling to cutback. So you rush to a lender (your owe big) who doesn’t give conditions but requires your assets security when you default for more money…who is the thief between the two? I already offered you advice on not taking on more debt for consumption they called me bitter…fast forward 5 years later you are in a mess you come back and state the same thing offer solutions…its clear they are incapable of running the affairs of the country as they are simply going down a debt sparrow…mind you half the govt was in China, I shudder just to think of the agreements that were signed behind our backs. Its ironic you state that you respect my comments but just a while back you were firing off all kinds of unpalatables from Odense, Denmark in my direction. Dr. Jagdish Bhagwati, the famous Indian-born economist in the US, told Manmohan Singh that Indians wastefully save. Ask them to spend, on imported cars and, seriously, even on cosmetics! This will put India on a growth curve. This is one of the reason for MNC’s coming down to India, seeing the consumer spending. The world is in a economical mess!!! Poor Zambians will pay the price instead..
As a Jesusist. Righteousness makes a nation great:sin a disgrace to any people.Name calling will not feed a hungry Zambian child. Our society must rid it’s self of lazyness. We as a generation need to come out of Tele Mundo and face reality. Most of us making comments on this issue don’t even manage a small business. We should be ashamed of our selves. If the railway built in colonial days was used to transport our heritage out of this country what do you think the roads and airport are for? Zambians. Let’s do business with these people . Politicians are hypocrics they never listen . Hard work is the answer a corrupt free business approach. I went out to the West End of London for drinks last night and on my way home, my Uber drove through Chinatown in SoHo, in the middle of London. This is a place where Chinese have literally taken over the hospitality business but no one makes a fuss and have never heard anyone complain that the Chinese are taking over our country. Is there anything that I’m not understanding about the Zambian complaint? My concern is the depth of mistrust for African Governments as revealed by Donald Trump who acts as the Chief of Whip of racists whites within the ranks of the Republican Party in USA. It is pathetic that Laura Miti and Sarah Longwe are happy to absorb Trump’s insults of Africans in Africa and USA. (1) Trump has called senior Blacks in USA as DOGS. (2) Trump has threatened Rwanda for developing its textile industries, but prefers Africa to continue importing USED NAPKINS AND PANTS FROM USA. (3) Trump is dismantling what Obama introduced for the poor in US. (4) Trump’s actions have forced UK’s Prime Minister May to explore worthy friends in Africa. LAURA MITI & SARAH LONGWE MUST WAKE UP TO REALITIES.